High temperatures today reached the middle to upper 30s for most places in Northeast Michigan. Despite a completely sunny day, a light breeze out of the northwest about 10 mph has kept temperatures cool. Temperatures tomorrow afternoon should warm a few degrees compared to the highs reached this afternoon, then more notable warmth will arrive Wednesday. 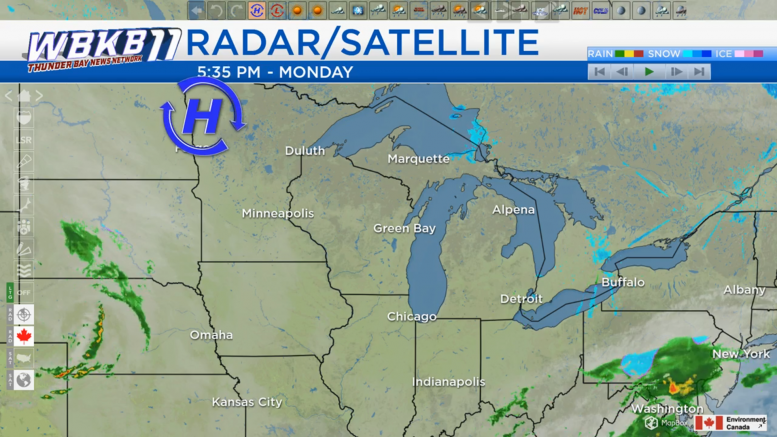 A high pressure system currently located near the Minnesota-North Dakota border is bringing us clear skies. It has also been directing winds out of the northwest into our area, giving us cool temperatures. By tomorrow afternoon, this high pressure system will arrive over Lower Michigan. It will maintain clear skies in our area through tomorrow, and even most of Wednesday. Overnight low temperatures will drop to around 15 degrees with clear skies and very light winds out of the northwest. We will see sunshine all day tomorrow as high temperatures reach 42 degrees in Alpena. Winds during the afternoon will be light and variable, only about 5 mph. 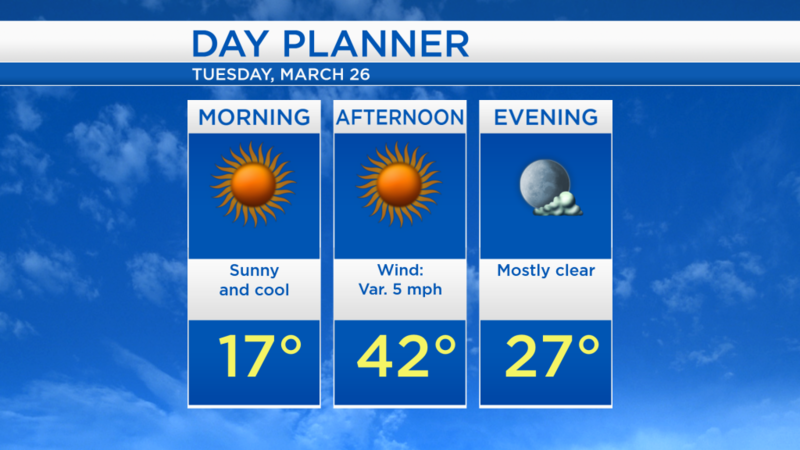 Sunny skies return tomorrow, and we will even see some sunshine on Wednesday. On Wednesday, clouds will increase throughout the day as afternoon highs warm to the lower 50s, then a weak disturbance could bring a few rain showers Wednesday evening. Wednesday night will remain warm, as overnight lows settle in the upper 30s. High temperatures will reach the lower 50s with a chance of showers early. Slightly cooler air arrives Friday with afternoon temperatures in the middle 40s, then it will get even colder air on Saturday. For the rest of Northeast Michigan’s weather forecast, watch the latest weather video by clicking the weather tab at the top of the page.